Redemptorist missionary Rev. Vincent John Douglass died quietly in his sleep on January 10, 2014, at St. Alphonsus Villa in New Smyrna Beach, Fla. He was 77 years old. Father Douglass and his twin brother were born on August 2, 1936. His parents were members of Our Lady of Perpetual Help Parish in Brooklyn, N.Y. 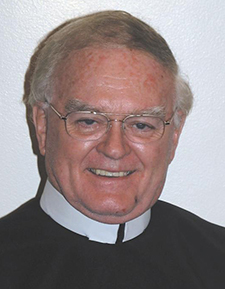 He professed his first vows as a Redemptorist on August 2, 1961, and was ordained on June 19, 1966. The path that led Father Douglass to his Redemptorist vocation was indirect and winding, to say the least. Like many before him, he completed elementary school at OLPH, but he did not attend the Redemptorist Preparatory Seminary in North East, Pa. Instead he obtained his high school diploma from St. Michael’s in Brooklyn and then took evening college courses at St. John’s University while working during the day to help support his family. When the Redemptorist parish priest, Father Wyatt, asked whether he had ever considered pursuing a religious vocation, Vincent expressed his interest in becoming a diocesan priest. Although Father Wyatt continued to minister to the many spiritual needs of the Douglass family, he also wrote a letter of recommendation on the young man’s behalf to the vocation director of the Diocese of Brooklyn. Because his background in Latin was insufficient, the diocese sent him to St. Jerome’s in Kitchener, Canada. While studying there, he met a group of young seminarians who invited him to visit the Redemptorist Seminary in Windsor. And the rest is history. After completing his theological studies at Esopus, N.Y., Father Douglass spent four years at St. Michael’s in Baltimore. Although he was extremely active in the apostolate as a parish priest, he was equally involved in the life of the community as the minister of the house. In 1971 Father. Douglass was transferred to the Vice-Province of Richmond, where he worked for more than 40 years of his nearly 48 years of priesthood. His ministries included serving at the vice-provincial residence in Richmond, at the Redemptorist retreat house in Hampton, and at several parishes in Virginia, North Carolina, Georgia, and Florida. In 2008 he was transferred to less active duties at St. Alphonsus Villa in New Smyrna Beach, where he died. When asked what kind of person he was, three of his classmates, without any consultation among themselves, responded in exactly the same way. He was a very peaceful and kind person,” said Father Joseph Freund. He brought tranquility to the community,” agreed Father Tim Keating. He was a peace-loving individual,” echoed Father John Lavin. He would never engage in harsh conversations or even in topics that led to quarreling. He was a great listener, which is probably why so many people came to him for counseling and advice. When it came to mission and ministry, especially for people who were in crisis, I know from personal experience that Father Douglass brought healing and love into many homes and hearts that were broken,” said Very Reverend Jerome Chavarria, the Vice-Provincial Superior. A viewing and wake service will be held at 7 p.m. Wednesday, January 15, at Sacred Heart Church in New Smyrna Beach. A Mass of the Resurrection will be concelebrated at 11 a.m. Thursday, January 16, at Sacred Heart, followed by interment in the Redemptorist section of the Edgewater Cemetery in Edgewater, Fla.